this pretty picture book is so on my list. am off to gussy up for the annual holiday work party. it's little women & egg nog tonight. yesss. can never get enough of jo march. image by tim walker (the great). oh, I love Christmas parties. And Little Women. Even my father and my hubby admit to liking the movie. Jo is a great heroine, an old friend. 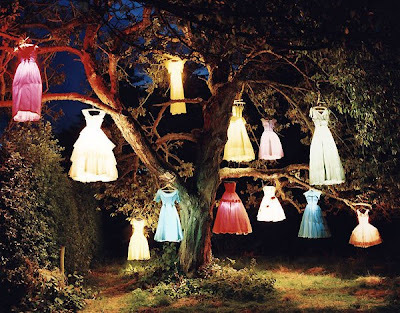 This image is fascinating & mesmerizing.... Oh to do something that whimsical as hanging dresses frokm tree branches... & illuminated...! Will be on my dream list! Love your blog! Glad I found it1 I'll be sure to return! which of those delightful dresses did you wear to the party? your night sounds so lovely- just perfect! I wonder which version of Little Women is your favorite. I am partial to the 1949 one with June Allyson, Elizabeth Taylor, and Janet Leigh. Just watched it last weekend on TCM. Never gets old! Haven't seen Little Women in ages.. I need to get on that! you are quite right , we can never get enough of jo march . I have this book on my list too!